If you’re in the process of landscaping your Southern California yard or even planning an entire outdoor remodel, you may be thinking about how to make your backyard more kid-friendly. The good thing is there are many structures and play features available, and the bad thing is there are so many it may be hard to choose. 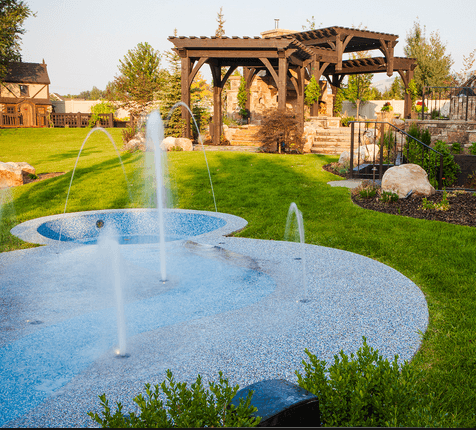 First and foremost, hiring a landscape contractor or landscape architect will allow you to consider your yard holistically and determine exactly what play structures best fit in your yard and where they would be best incorporated. The contractor will also point you in the right direction of subcontractors who can build these structures safely and soundly. Which brings us back to the main point: how do you choose what to add to your yard for the ultimate kid’s paradise? A splash pad is basically a concrete pad with built-in water jets and fountains. Usually, the water is stored in an underground tank and filtered/recycled for water conservation. Splash pads are generally safer than swimming pools and easier to clean and maintain. They can also be as simple or as complicated as you decide to make them. Water features can be incorporated, as can varying levels of water spray and heights of the features themselves. For safety, consider adding non-skid surfaces to minimize slips and falls. No doubt that playhouses can provide hours of fun for the little ones (and when the kids grow up, you can repurpose it as a storage shed!). 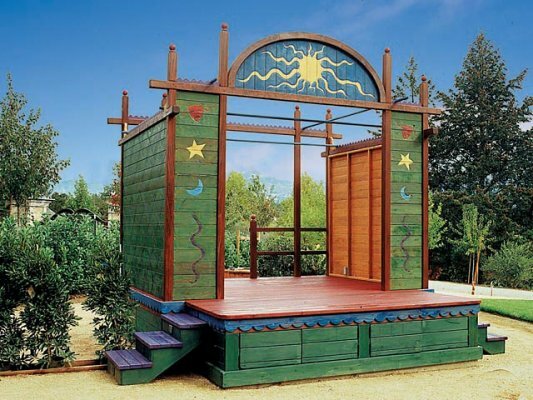 There are literally dozens of options when it comes to playhouses and the sky’s the limit dependent on the size of your backyard and your budget. It’s a great idea to involve the kids in the design process so the playhouse is uniquely their own. For safety, only the sturdiest materials should be used and again, using a contractor should ensure solid construction. (Anyone love Treehouse Masters as much as we do?) I mean, what else speaks to childhood memories better than a treehouse? If you have a healthy tree with a large enough diameter to support the construction of a treehouse, this is an excellent option for backyard fun. 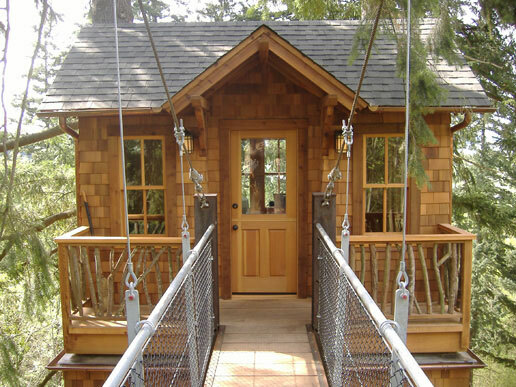 In addition, living in San Diego means your treehouse won’t be exposed to as many elements as elsewhere in the county so moisture and rusting shouldn’t be as rampant – although they are still important to keep in mind when choosing materials and maintenance. It’s our recommendation that you seek “professional help” when designing and building a treehouse for safety’s sake, and your contractor or landscape architect can surely recommend one. Ziplines have increased in popularity over the years and having one in your backyard is sure to be a kid magnet. You’ll obviously need a suitable location between two trees with space between. Again, there are options: do you want your zipline to go downhill (in that case use a “braked” zipline) or a tamer, lower-to-the-ground model? Safety is a huge consideration with zip lines, so be sure to properly survey your property for proper placement and work with a pro to choose the best setup for your situation. Finally: always, always schedule inspections to check for wear and tear. If the kids need more places to climb and play in the backyard, a playground can be ideal. Of course, you’ll need to think about how big of a set you need and what features you want included (slides, rock walls, bridges, ropes, swings). It’s also good to anticipate how many kids you imagine playing on the set on average (i.e. do you have frequent play-dates? do you entertain families often?) and build with that number in mind. Materials are important here and so the wood you choose is key as is ensuring the metal is galvanized and treated with lead-free, rust-resistant paint. Safety-wise, keep an eye out for spaces that can trap kids (ladder rungs, other openings) and check for tripping hazards and raised points or edges. Your contractor will hopefully keep these things in check and follow all US Consumer Product Safety Commission safety guidelines. Although many play-sets include climbing walls, you may be thinking of adding a free-standing wall for exceptionally active kids. As with the other structures, proper location and layout are crucial for optimum performance and fun. As you are considering design, you might want to take a look at the walls at your local climbing gym for layout and climbing holds ideas. As for safety, fall height must be considered and rubberized safety surface tiles are absolute musts. Your landscape contractor should have access to residential climbing wall builders, so just be sure your vision is represented in the final design with safety first. If you’ve got the space, an obstacle course is the perfect way to keep kids entertained and healthy. Although obstacle courses are something you can create and build yourself, for aesthetic integration into your existing design and for stringent adherence to all safety standards, consider speaking to your contractor about adding an obstacle course in the initial landscape design phase. 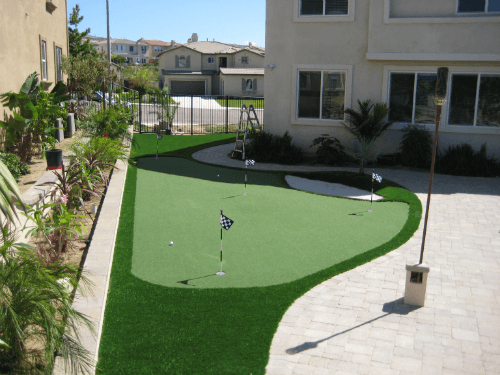 Usually made with artificial turf, putting greens are a fun addition to your backyard and perfect for kids’ (and adult!) parties and get togethers. As you might expect, fun add-ons are trampolines, badminton nets, hammocks, pools (although that’s hardly an “add-on,”), sandboxes, and basketball hoops. Many of these features (not the pool!) can be added after the finished design, but once again, it’s preferable to speak to your landscape contractor or architect about how to harmonize these elements into your overall backyard look. — Foam padding and rubber mulch made soft places for kids to land around many structures. The surface should extend at least six feet around every edge of the structure. — Consider adding benches or informal seating areas around the kid-friendly features so parents have a comfortable spot from which to observe and relax while the kids play. — Decide on a regular maintenance and inspection schedule. During this time check for sharp points or edges, worn pieces and frayed cords, etc. — Choose your landscaping carefully. Rose bushes don’t belong around swings, for instance. Place all your fragile plants far from where kids balls and feet may land and add low-maintenance and hearty plants and shrubs near play areas. With a little time and effort, you can build the backyard play area of your kids’ dreams, and if you’re lucky, you’ll keep them near home more often (while you relax more often). 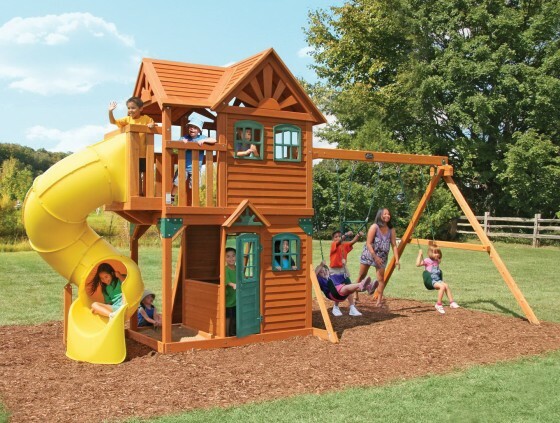 What are some of your favorite backyard play structures?